I work with a lot of instructors, many of them teaching for the first time. We talk about the design of the course, what active learning techniques to use, things like that. I often forget about the basics, though, like how to use the lav mic, managing the classroom, and (the subject of this post) how to write on the chalkboard. (I’ll use “chalkboard” – some people call it the “blackboard.” These tips apply to using whiteboards, too.) The sobering part is, the best-laid plans of the instructor are irrelevant if students can’t read the chalkboard. [Update 7/7 after re-reading the excellent comment from Andy Rundquist.] Instructors need to think hard about how to create opportunities for active learning in their classes. Students learn when they’re creating and challenging their own understandings and ways of thinking, especially in collaboration with their peers. If an instructor’s lesson includes episodes of lecture when material is presented on the chalkboard (and lectures in small doses can be very effective), the instructor needs to ensure that activity has value. And one sure way to lessen its value is poor board work. Many of the points below are directed at instructors who use the chalkboard to derive formulas or solve math problems but many apply equally to instructors who write names, concepts, theories, dates, etc. on the chalkboard while lecturing. Disclaimer: Some of these points may seem obvious and there are legitimate reasons to ignore any one them. And c’mon, writing on the chalkboard — how hard can it be, right? Well, I’ve witnessed instructors “break” every one of these tips. Not because they’re malicious or lazy but because it’s how they learned when they were students. Writing on a chalkboard is different than writing on paper – it takes your whole arm moving from your shoulder rather than just your hand resting on the page. It can be tiring. And it’s a skill that takes practice. The first time you write a complete sentence or a derivation on the board should not be your first class. If you haven’t done it before (or haven’t done it in a while), find an empty classroom and practice. Write larger than you think you should, especially if there are (matrix) subscripts. I know, it looks huge to you. That’s because you’re standing right there, mere inches from the board! Students don’t have the expertise to know matrix entries are always xij, for example, so they’re struggling to accurately copy exactly what’s on the board. The smallest characters need to be visible to the students sitting farthest away. The writing has to be legible – you can’t count on students listening to you as you scribble an expression or someone’s name on the board: they have to be able to read it. Be careful to write in roughly horizontal lines. It’s not uncommon to see instructors start writing at their eye-level and then the text drops down to the right along the “arc” of their arm. (Maybe this is true only for right-handed instructors?) Instead of reaching, shuffle your feet along as you write. your students probably aren’t listening. They’re half a board behind you and all you’re doing is distracting them or splitting their attention (Should I be copying the notes or listening to him speak?) When you write something on the chalkboard, finish writing, step out of the way, and give the students time to copy it into their notes. You’ll see their heads bobbing up and down from the board to their notes as they draw/copy. When the bobbing stops, they’re ready to listen to you and follow as you talk them through it. Don’t hesitate to stand at the board with notes you carefully wrote on paper, and copy them out. You don’t need to re-derive the results or solve problems in real time on the board. You should be concentrating on making it legible rather than using your brain to actually do the derivation. The students won’t think less of you because you’re not doing it “live” but they will get frustrated if you regularly get stuck. Don’t be that prof with chalk in one hand, the eraser in the other, who goes back and corrects mistakes. There are a hundred questions about how to use PowerPoint and/or the chalkboard but I’m only going to address one here: instructors who present the majority of their content through PPT slides and add snippets of content on the chalkboard. You should imagine a math instructor who does worked examples on the chalkboard or a philosophy instructor who write key names or phrases on the board. Let me use the math example to describe what I’ve seen:The instructor flips through PPT slides, flip, flip, flip, walk to the chalkboard for a quick calculation/derivation, flip, flip, flip, draws a graph, flip, flip,… What do the students end up with in their notebooks? A series of context-free, unrelated bits of math. Later, when they’re studying from the PPT slides, they don’t know to look in their notes for the supplemental info. When they look through their notebooks, they don’t know where any of these snippets come from. Students don’t have a chronological record of what happened in class.What to do about it? 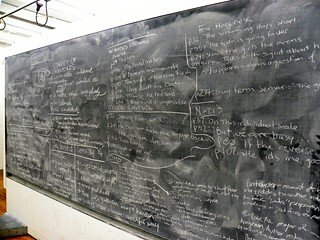 Instructors could abandon PPT and do the whole class on the chalkboard. Or they could abandon the chalkboard and only use PPT. There are pros and cons to both of these. If you insist on using a mixture, how about this: Each time you write something on the board, start by writing a label or tag that marks where the snippet goes. Nothing huge and energy-sapping, just write “(Slide 24)” on the board before you proceed. Coach the students to have their notebooks open next to their computers when they study so when they flip, flip, flip to slide 24, they see the matching supplemental content in their notebooks. Experts often talk about equations and results, with “testing” (“Wait, let’s check the units here…yep, m/s^2. Okay, so…”) and “sense-making” (“Notice if Mass 1 is much, much larger than Mass 2, this reduces to the simpler case from last time – good.”) This is where you share your expertise with the class! It’s the rationale for why this follows that, why you use this approach instead of that one, how you know this result is correct (well, not wrong, at least). Instead of only saying it aloud, write it down. When the students are reviewing and studying later, they’ll see those flashes of expertise in context in their notes. You’ve probably seen it: the instructor solves a long problem or does a long derivation that takes a chalkboard panel or two. The next part of the lesson is solving a similar problem, this time with mass m=50kg, with 4x instead of 2x, or with amino acid A instead of T. The instructor works his way through the chalkboards with chalk in one hand, an eraser in the other, making all the little changes, and eventually, reaching a new conclusion. Students can only record notes by working down the page, not jumping back and changing, updating, or re-using things.If you draw a diagram or write an expression like a big matrix and then come back to that panel of the chalkboard later, if you need to use it again, you have to write it out again, giving students the time to write out it out, too. That’s the only way students will have the correct sequence of notes. Yes, this takes longer but you have to let the students keep up. The board is “landscape” but students notebooks are “portrait”. Don’t write long expressions by working farther and farther across the chalkboard because students cannot reproduce that in their note books. Consider drawing a line vertically down the middle of the chalkboards, creating “pages” on the board. Work your way down each page and then to the right. If you’re writing a long calculation or derivation, you should already have it on paper. Your sheet of notes is “portrait” so it will automatically set the width of the work on the board. When you re-use a chalkboard, fully and deliberately erase it completely. All the way to the top and all the way to the tray on the bottom. If there are marks, lines, ticks left behind, students may think those marks part of the new material. We know that little chalk line is left over from before but to a student, it might look like a prime or an accent. Remember, they’re not always copying notes “in real time” – they’re often a board behind (because they have to wait for you to move out of the way) and they won’t notice the tick marks are NOT part of the new material. I’ve had math profs who come to class with a box of colored chalk and create glorious, multi-colored graphs where white means one thing, blue means another, red…, green,… And I’m sitting there with a pencil and a pen – two colors. Unless you’ve asked your students to bring colored pens and pencils to class, you should stick to two colors, max. I’m forever grateful to my first graduate-level quantum prof, Luis de Sobrino, for teaching us how to write complicated matrices in our notebooks and on the board so that the entries are centered down each column. The problem is, when you write entry a11, how do you know where to write it so it ends up centered on the column (especially when entry a31 is a longer expression)? The trick, de Sobrino told us, is write the longest entry first. You can easily estimate where the row should be so go down that far and write the longest entry. This sets the width of the first column. Then add the other entries in the column above and below, centered in the first column. Now move to column 2, and so on. The thing is, de Sobrino made sure to tell us this trick because no one noticed what he was doing (we were still copying the expressions on the previous board and didn’t witness the creation of this work of art.) So, if writing expressions, sketching certain kinds of graphs (like trying to draw in 3D in math class), or drawing a map of France is a skill you want your students to learn, teach them how to do it. What did I miss? What do you do that’s different from the suggestions here? Which of these tips do you think is completely wrong? Feel free to leave a comment! The one comment in here that I really disagree with is that the students will only write down what you write down. I used to believe that and I used to say it a lot. But I have vivid memories of an art history professor, who was new to my institution, just railing against that concept. She said that we’re just spoon feeding them content if that’s the philosophy. That was quite a watershed moment for my teaching. I have to say that’s what really sent me down a (meandering) path exploring active classrooms. That new philosophy then colors my response to most of the tips in this post. Especially for courses that have texts that contain lots of examples, I think the suggestions for making sure that the students notebooks are good copies of the book are not good ideas. Instead I try to focus on having conversations with and among my students to try to figure out what’s important. Now, having said that, my most recent pedagogical experiment (back flip with SBG in general physics) got a bunch of student eval comments saying they were frustrated that I didn’t demonstrate how to solve problems. I take those comments to say I have to structure class better so that they’re solving problems while also making sure that we all capture the big ideas to study later. I guess what this post has me thinking about is what students notes are for. Are they to recreate the text? Are they for sense making? Are they, like they were for me, something for my eye/brain/hand system to do in class to cement the knowledge? Excellent and thought-provoking comment, Andy. Spawned a short and incomplete update to the post. As a left-handed person, I can confirm that when I write on the board, my lines of text tend to drift upwards instead of downwards. About integrating ppt and chalk- what do you think about posting the slides beforehand so the students can print out the ppts with space for notes on the side? It seems to me that a large proportion of the students reliably write their notes around and on the slides if you give them an opportunity to do so, so their notes are integrated into the flow of the lecture. But in general, I second Andy’s comment. It seems literally medieval to me to spend large chunks of class time transferring text from the instructor’s notes to the student’s notes. This, too, is going to require more thinking. So thanks, Wanda! Thank you so much for making such a concise list! I’m in my first year teaching, and its really frustrating to try and get my notes to translate to student notes and understanding. I thought that years in grad school would have taught me how to write on the board, but it turns out that all those lessons learned just disappear when you’re in the hot seat! It is really helpful to have reminders, and hopefully I can make my lectures more useful. It’s amazing to read your post and it’s quite interesting too. It is very much important for the teacher to practice on a chalkboard that how should he/she write. You have discussed a great topic, it looks very easy to write but it is not as easy as we think because a teacher has to write in such a way that students can understand clearly. Your tips are too good and it can help teachers to understand the basic of writing on the chalkboard. This site was very helpful , much appreciation i hope this will help as i am currently studying teaching.